Soxhlet versus cold maceration: Which method gives better antimicrobial activity to licorice extract against Streptococcus mutans? Purpose: Licorice is called “grandfather of herbs” and is being used for wide various ailments since time immemorial. However, its use in dentistry has been recently. Soxhlet and Cold maceration are the two commonly employed methods for extraction of drug from raw products. But which of two is gives better antibacterial property to licorice root remains unanswered. Hence, the present study has been planned with an aim to compare antibacterial activity of licorice root extracts obtained from two methods (Soxhlet and cold maceration) against Streptococcus mutans. It is an in vitro study. Methodology: Licorice roots were authenticated from recognized taxonomist. They were washed, dried completely, and coarsely powdered. The weighed powder was mixed with ethanol (100 mg in 500 ml). Two such mixtures were made. One was used for cold maceration procedure and the other was used for Soxhlet method. Extracts so obtained were assessed for their minimum inhibitory concentration against S. mutans ATCC 25175 in triplicates using broth dilution and disc diffusion method. Extracts were also compared for their phytochemical components. Descriptive analysis and unpaired t-test were performed. Results: Cold maceration extract at concentration of 1.95 mg/ml and Soxhlet method at 3.906 mg/ml showed inhibition of S. mutans. Both of them possessed the same phytochemical components. Conclusion: Licorice root extract obtained through cold maceration had significantly better antimicrobial activity against S. mutans than licorice extract obtained through Soxhlet method. Cold maceration method is relatively simple and does not involve complex instruments and yet yields better extract. Literature has a report of licorice being used for oral diseases such as dental caries, periodontal diseases, candidiasis, and recurrent aphthous ulcers. It has also been used as a mouthwash and lollipop for control of tooth decay., The aciduric mutans streptococci (MS) group, including Streptococcus mutans and Streptococcus sobrinus, are highly cariogenic and represent microorganisms most closely associated with dental caries. The oral cavity contains at least 52 genetic strains of S. mutans., Some MS strains may have enhanced abilities to adhere and propagate in specific oral environment  including selective colonization of hard-tissue sites. In addition, several MS strains have been known to concurrently colonize a single tooth, and single genotypes have been identified to colonize multiple sites within the dentition of individual patients. Hence, S. mutans is considered as the main culprit for dental caries and was thus selected for the present study. Ayurvedic products are polyherbal by nature and are found in the crude form. There are many extraction procedures which are available to obtain the desired drug. Most commonly followed extraction methods are Soxhlet method and cold maceration. Soxhlet extraction has been used for many decades, is very time-consuming, and requires relatively large quantities of solvents. It also needs Soxhlet extractor special equipment for the process. On the other hand, cold maceration is a simple procedure which does not require any special armamentarium. Cold maceration always results in an odor similar to that in the original plant material without causing degradation of the thermolabile compounds present in the fraction due to the low extraction temperature similar to cold pressing. Although various methods have been described in the literature for extraction of crude drug, a scientific comparative study to know which method is superior over the other is lacking for licorice extract. Hence, the present study has been planned with an aim to compare the antibacterial activity of licorice extract obtained using cold maceration and Soxhlet method against S. mutans. The present study is an in vitro study, and ethical approval was obtained from the Institutional Ethics Committee No. 820 dated January 28, 2014, KLE University. Standard strain of S. mutans ATCC 25175. Licorice extract was prepared using two different methods which are cold maceration and Soxhlet method. Purchased licorice root specimen was authenticated from recognized botanist at Indian Council of Medical Research's Regional Medical Research Centre, Belgaum. After washing all the roots, they were dried in the shade for 3–4 days. Roots were cut into small pieces in a grinder and were grounded to coarse powder. One hundred grams of licorice powder was mixed with 500 ml of 100% ethanol in a conical flask. The mixture was stirred thoroughly with a glass rod. The conical flask was kept with intermittent shaking for 72 h. The mixture was filtered using muslin cloth and through Whatman No. 1 filter paper. The filtrate was concentrated using an IKA rotary evaporator at 40°C, and the resultant residue was kept in a refrigerator till further use. One hundred grams of coarse powder of licorice root was packed in a muslin cloth bag and placed in the body of Soxhlet extractor. Then, 500 ml of ethanol (solvent) was poured in the round-bottom flask. The apparatus was then fitted with the help of clamps and stand to support the Soxhlet extractor, round-bottom flask, and condenser. The rubber tube connected to the tap water was attached to the condenser for continuous flow of water. The solvent was heated using the isomantle, which began to evaporate, moving through the apparatus to the condenser. The condensate then dripped into the reservoir containing the plant extract. Once the level of solvent reached the siphon, it poured back into the flask and the cycle began again. The process was made to run for a total of 6 h. Finally, the extract was collected in the round-bottom flask. Once the process was finished, the ethanol was evaporated using IKA rotary evaporator at 40°C, leaving a small yield of extracted plant material (about 2–3 ml) in the glass-bottom flask. Extract was kept in a porcelain bowl till the remaining ethanol was completely evaporated. The content of extractable matter was calculated in mg/g of air-dried material using digital weighing balance. The extract was stored in the refrigerator till further use. 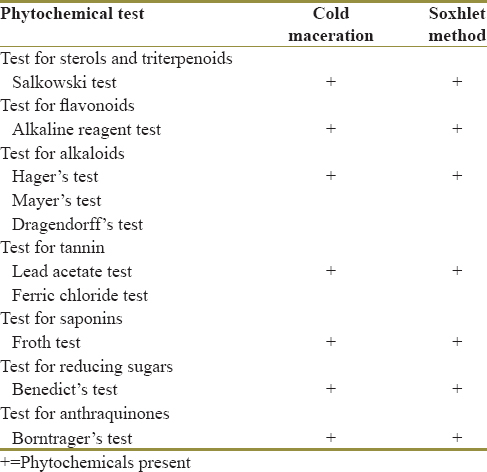 The ethanolic extracts obtained from both the techniques were subjected to preliminary phytochemical screening for qualitative detection of phytoconstituents using standard procedures as described by Trease and Evans. The microbial strain used for this study was procured from the Institute of Microbial Technology, Chandigarh (ATCC 25175). Stock cultures were maintained at 4°C on the slant of nutrient agar. Active cultures for experiments were prepared by transferring a loop full of cells from the stock cultures to test tubes of nutrient broth for bacteria which were incubated for 24 h at 37°C. Determination of antimicrobial activity of the licorice extract was done as per the Clinical Laboratory and Standard Institute guidelines. MIC of the extract against S. mutans (ATCC 25175) by broth dilution method was carried. Media used was brain–heart infusion (BHI) broth. Culture/inoculum: S. mutans. Stock solution of the extract: 50% (500 mg in 1 ml of dimethyl sulfoxide). Licorice extract-Soxhlet extraction method (LS). Nine dilutions of extract were done with BHI for MIC. In the initial tube, only 200 μl of extract was added. For dilutions, 200 μl of BHI broth was added into the next nine tubes separately. In the 2nd tube, 200 μl of extract was added which already contains 200 μl of BHI broth. This was considered as 10−1 dilution. From 10−1 diluted tube, 200 μl was transferred to the second tube to make 10−2 dilution. The serial dilution was repeated up to 10−8 dilution for each extract. From the maintained stock cultures of required organisms, 5 μl was taken and added into 2 ml of BHI broth. In each serially diluted tube, 200 μl of above culture suspension was added. The last tube contained only the media and culture suspension. The tubes were kept for incubation for 24 h at 37°C in bacteriological incubator and observed for turbidity. The experiment was repeated in triplicate for both LS and LC, to ascertain the antimicrobial activity. Disc diffusion method was carried out to confirm the results of broth dilution method. Approximately 8 g and 6.5 g of licorice extract were obtained from 100 g of powder through cold maceration and Soxhlet method, respectively. For broth dilution method of MIC, turbidity was seen in the ninth tube of cold maceration method and eight tube of Soxhlet method. Further result was confirmed with the help of disc diffusion method in which the zone of inhibition was noted. All the experiments were repeated in triplicates, and the average value was taken. [Table 1] shows the MIC values of the triplicate experiments. The mean MIC value for cold maceration was 1.8 ± 0.145, and for Soxhlet method, it was 3.8 ± 0.097 [Table 2]. When unpaired t-test was applied, P = 0.000 with 95% confidence interval which concluded that there was a statistically significant difference between MIC values obtained through two methods [Table 3]. When phytochemical screening was performed, both the extracts showed the presence of components as shown in [Table 4]. Licorice has been used in Ayurveda for many ailments, and the literature search shows that it has good scope to be used in medicine and dentistry as an adjunct to allopathic drugs. Its effectiveness on general health problems has been well documented, but its effect on S. mutans, the main culprit in the initiation of dental caries, is sparsely reported. Ayurvedic drug formulation is known as pancavidhaa kasayaa and has description of five basic forms: Swarasa, Kalka, Kwatha, Sheeta, and Faanta. Ayurveda believes that a plant as a whole may not have therapeutic effect, and hence, the active ingredients need to be extracted from the whole plant. The type of extraction procedure selected should be based on the nature of the constituents. If the constituents are thermolabile, then extraction procedures such as cold maceration and percolation are preferred. The major constituents of licorice are triterpenoids and flavonoids, apart from small quantities of pyrrolopyrimidine alkaloid and tetrahydroquinoline alkaloids.,, The chemical components responsible for antioxidant and antibacterial activity present in G. glabra roots have been reported such as glycyrrhizin, glycyrrhizinic acid, glabridin, glabrene, glabrol, licoflavonol, glycyrol, licoricone, formononetin, phaseollinisoflavan, hispaglabridin A and B, 3-hydroxyglabrol, and 3 methoxyglabridin, glabranin isomer.,, Flavonoids and phenylpropanoids can degrade when kept in organic solvents. Glycosides tend to break up when exposed to higher temperatures as in case of Soxhlet extraction. We can contemplate that differences in MIC values observed in the present study could be attributed to differences in flavonoid concentration which is responsible for antibacterial activity of licorice to a large extent. Alcohol is neutral and hence extract products obtained from it are compatible with other products, small amount of heat is required to concentrate the alcoholic preparations, and it dissolves selective active constituents of the drug. This postulate was tested by Ahmad et al. and Jain et al. who concluded that ethanolic extract of licorice had better antimicrobial activity. This might be attributed to the polar nature of the solvent ethanol which resulted in leaching of more active ingredients during extraction. The phytochemical screening revealed the presence of carbohydrates, reducing sugars, terpenoids, glycosides, steroids, tannins, saponins, anthraquinones, flavonoids, and alkaloids. The presence of these secondary metabolites could contribute to the antibacterial activity of the extracts. It is interesting to note that these components were present in both the extracts, but however, the MIC value of both differed significantly. This difference could be attributed to the difference in solubility of both the extracts. In the present study, the cold maceration extract dissolved completely than extract obtained by Soxhlet method. A comparison between different methods for extraction of glycyrrhetic acid from licorice stolons was reported by Sharad Visht  which concluded that extraction ratio of glycyrrhetic acid can be increased by changing pH of extraction solvent. In the present study, cold maceration proved to be better than Soxhlet method for extraction of licorice roots. The study result is of practical significance which demonstrates that licorice extract obtained from simple method of cold maceration is superior to the extract obtained from Soxhlet method which needs special apparatus for carrying out the procedure along with continuous supply of tap water for at least 24 h apart from requirement of personnel to monitor the procedure. Hence, future studies which are planned on licorice roots can directly adopt cold maceration method for obtaining extract. The study has some limitations such as the use of single organism. It is a known fact that dental caries is a multifactorial disease and etiology has been attributed to various causative microorganisms. However, S. mutans is predominant of all cariogenic microorganisms, and hence, it was selected in the present study. In future, studies can be conducted on various other cariogenic microorganisms to know if licorice extract has broad-spectrum antimicrobial activity. Confirmatory tests such as thin-layer chromatography (TLC)/high-performance TLC can be carried out to know if there is any difference in the concentration of active ingredients of both cold maceration and Soxhlet extract. The present study concludes that the licorice root extract obtained from cold maceration method showed significantly better antimicrobial activity than extract obtained from Soxhlet method against S. mutans. Gyanendra Pandey. Drvyaguna Vigyan. Vol II. New Delhi: Chavkhamba Publication; 2004. p. 456-68. Tao R, Tong Z, Lin Y, Xue Y, Wang W, Kuang R, et al. Antimicrobial and antibiofilm activity of pleurocidin against cariogenic microorganisms. Peptides 2011;32:1748-54. Sastry DJ. Dravyagunn Vijnana. Varanasi: Chavkhamba Publication; 2013. p. 152-6. Touyz LZ. Liquorice health check, oro-dental implications, and a case report. Case Rep Med 2009;2009:170735.
de Marsillac Mde W, Vieira Rde S. Assesment of artificial caries lesions through scanning electron microscopy and cross-sectional microhardness test. Indian J Dent Res 2013;24:249-54. Messier C, Epifano F, Genovese S, Grenier D. Licorice and its potential beneficial effects in common oro-dental diseases. Oral Dis 2012;18:32-9. Peters MC, Tallman JA, Braun TM, Jacobson JJ. Clinical reduction of S. Mutans in pre-school children using a novel liquorice root extract lollipop: A pilot study. Eur Arch Paediatr Dent 2010;11:274-8. Jain E, Pandey RK, Khanna R. Liquorice root extracts as potent cariostatic agents in pediatric practice. J Indian Soc Pedod Prev Dent 2013;31:146-52. Napimoga MH, Höfling JF, Klein MI, Kamiya RU, Gonçalves RB. Tansmission, diversity and virulence factors of Sreptococcus mutans genotypes. J Oral Sci 2005;47:59-64. Tabchoury CP, Sousa MC, Arthur RA, Mattos-Graner RO, Del Bel Cury AA, Cury JA, et al. Evaluation of genotypic diversity of Streptococcus mutans using distinct arbitrary primers. J Appl Oral Sci 2008;16:403-7. Svensäter G, Larsson UB, Greif EC, Cvitkovitch DG, Hamilton IR. Acid tolerance response and survival by oral bacteria. Oral Microbiol Immunol 1997;12:266-73. Baca P, Castillo AM, Baca AP, Liébana MJ, Junco P, Liébana J, et al. Genotypes of Streptococcus mutans in saliva versus dental plaque. Arch Oral Biol 2008;53:751-4. Hardie JM. Oral Streptococci. In: Sneath PH, Mair NS, Sharpe ME, editors. Bergey's Manual of Systematic Bacteriology. Baltimore, MD: Williams and Wilkins; 1986. p. 1054-63, 12. Wu C, Wang F, Liu J, Zou Y, Chen X. A comparison of volatile fractions obtained from Lonicera macranthoides via different extraction processes: Ultrasound, microwave, soxhlet extraction, hydrodistillation, and cold maceration. Integr Med Res 2015;4:171-7. Trease GE, Evans W. Pharmacognosy. 14th ed. London, UK: WB Saunder Company Ltd; 1996. p. 612. Cockerill FR, Wikler MA, Alder J, Dudley MN, Eliopoulos GM, Ferraro MJ, et al. Performance standards for antimicrobial disk susceptibility tests; approved standard. Wayne, Pennsylvania, USA: Clinical and Laboratory Standards Institute; 2012. p. 76. Sedighinia F, Safipour Afshar A, Soleimanpour S, Zarif R, Asili J, Ghazvini K, et al. Antibacterial activity of Glycyrrhiza glabra against oral pathogens: An in vitro study. Avicenna J Phytomed 2012;2:118-24. Savrikar SS, Ravishankar B. Bhaishajya kalpanaa - the ayurvedic pharmaceutics - an overview. Afr J Tradit Complement Altern Med 2010;7:174-84. Rao KV. A review on licorice. Anc Sci Life 1993;13:57-88. Fukai T, Tantai L, Nomura T. Isoprenoid substitute flavonoid from Glycyrrhiza glabra. Phytochemistry 1996;43:531-53. Gupta VK, Fatima A, Faridi U, Negi AS, Shanker K, Kumar JK, et al. Antimicrobial potential of Glycyrrhiza glabra roots. J Ethnopharmacol 2008;116:377-80. Gupta A, Maheshwari DK, Khandelwal G. Antibacterial activity of Glycyrrhiza glabra roots against certain gram-positive and gram-negative bacterial strains. J Appl Nat Sci 2013;5:459-64. Aulton M. Aultons Pharmaceutics :The design and manufacture of medicine. 4th ed. London: Churchill Livingstone; 2013. Ahmad I, Mehmood Z, Mohammad F. Screening of some indian medicinal plants for their antimicrobial properties. J Ethnopharmacol 1998;62:183-93. Sharad Visht GK. A comparison between different methods for extraction of glycyrrhetic acid from licorice stolons. Int J Pharma Prof Res 2012;3:622-6.